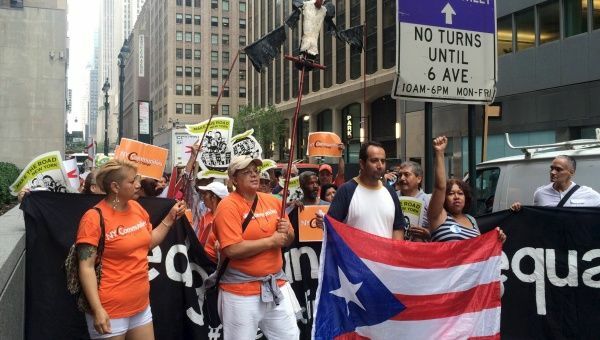 Puerto Rico: Troubled Commonwealth or Debt Colony? The crisis in Puerto Rico raises a deeper political question that for years has lurked just beneath the surface of the US territory, namely Puerto Rico’s true status: dependent US commonwealth or neocolonial possession? It may not dominate international headlines as Greece has, but Puerto Rico is facing a strikingly similar crisis, one which threatens to tear apart the very fabric of its society. With a crushing debt burden poised to collapse the US commonwealth, many alleged experts have warned that only through painful “reforms” (read austerity) can the island territory make any economic progress. But at what price is this “progress” to be attained? The question of ultimate responsibility is, just as with Greece, multifaceted. On the one hand, years of mismanagement have taken their toll on the economy, leading in part to the current crisis. On the other hand, Puerto Rico has been the victim of a predatory capitalist campaign waged by major Wall Street banks, as well as hedge funds and private speculators, who have become heavily overleveraged in Puerto Rican debt through reckless bond purchases while Wall Street has fattened itself playing the role of middleman. But the crisis in Puerto Rico also raises a deeper political question that for years has lurked just beneath the surface of the US territory, namely Puerto Rico’s true status: dependent US commonwealth or neocolonial possession? While Greece has been a member of the European Union, thereby at the very least giving it the illusion of democratic representation, Puerto Rico has remained little more than a colonial possession – an economic and political vassal of the Empire, subject to its rules and at the mercy of its lenders, while having no political representation or legal recourse. In short, Puerto Rico’s crisis demonstrates unequivocally that the small island commonwealth, and its 3.5 million inhabitants, are little more than neocolonial subjects. Any close analysis of the financial crisis in Puerto Rico immediately shows that the current dire situation was by no means unexpected. In fact, when Governor Alejandro García Padilla declared that “The debt is not payable,” he was merely confirming what keen financial analysts had known for a long time: Puerto Rico was in a vicious downward spiral that would ultimately require extraordinary intervention in order to rescue the troubled island. But one need not be a world class economist to understand that this was undoubtedly the case. The precipitous decline of Puerto Rico’s GDP growth, which dropped from a high of almost 10% in 2001 to its low of -3.3% by 2007, coincided directly with a massive explosion of debt accumulation in the form of bond selling. In 2000, Puerto Rico’s debt was 63.2% of its gross national product (GNP), but by 2015 it had reached a staggering 100.2% of GNP. The negative impact of such an obviously unsustainable rise of debt accumulation was magnified by a number of circumstances, including the expiration of Section 936, a tax incentive which attracted a number of large companies to invest in Puerto Rico, and the onset of the global financial crisis of 2008 which lowered tax revenues while everything from infrastructure to pension costs continued to soar. In addition, prices in the housing market have continued to decline, dropping by 27% since 2007, while the labor participation rate has fallen to around 40% and official unemployment has been around 12%. Of course, everyone wants to place the blame somewhere. Generally, in such situations, political leaders are immediately singled out, and Padilla’s government has already received a good deal of criticism, some of which is somewhat unfair considering he only assumed the governorship in 2013. In fact, the statistics show that the debt increase was roughly equal in each of the preceding five terms from the four previous governors. Therefore, it’s quite clear that rather than obvious mismanagement and corruption, there was a structural and systemic problem that allowed the crisis to metastasize. Rather than politicians, the real culprits are the Wall Street banks who have parasitically, and quite handsomely, profited from Puerto Rico’s financial straightjacket. Barclays, Morgan Stanley, Goldman Sachs, JP Morgan, Bank of America-Merrill Lynch, and many others rushed to underwrite massive loansin the form of bond purchases in order to then turn around and sell those bonds to hedge funds and other investors in the US and around the world, thereby raking in tremendous profits on the underwriting fees. Essentially, Wall Street banks came in with enormous capital then transferred the risk on to other speculators, while making handsome profits as middlemen. Aside from being woefully inaccurate, such predictions illustrate precisely why major hedge funds are now on the hook, and why mutual fund management giants OppenheimerFunds and Franklin Advisers are now intimately involvedin the debt restructuring negotiations with San Juan. Those two companies alone own roughly 15% of Puerto Rico’s debt, and while acting in their own interests, are surely also collaborating to prevent a collapse in bond values for their Wall Street cronies in the hedge fund world. Moreover, it was OppenheimerFunds, a unit of insurer MassMutual Financial Group and Franklin Templeton, which successfully sued the Puerto Rico Electric Power Utility (PREPA) to prevent it from restructuring its debt and possibly forcing financiers to take a haircut. And so, despite the passage of the Puerto Rico Public Corporation Debt Enforcement & Recovery Act, US courts have effectively acted in the interests of speculators to block Puerto Rico from acting to restructure its debt. Chief among these austerity measures recommended by Krueger & Co. is an attack on workers including a proposed exemption from adherence to the US federal minimum wage of $7.25 per hour. Additionally, the report suggests exemption from other labor laws including a redefinition of overtime, reduction of vacation days, elimination of end-of-year bonuses, relaxation of youth labor laws, as well as making it easier for employers to fire employees for any minor infraction, among other things. The report also recommends reducing the staffing of PREPA in order to lower costs (not, of course, reducing the cost of electricity to working class and poor Puerto Ricans), reducing and/or eliminating welfare programs aimed at poverty reduction such as food stamps, housing benefits, etc. Krueger and her cronies also call for the reduction of Medicaid benefits which provide health care coverage to those in the most extreme poverty. In short, the report reads like a manual for austerity in the near and long term. Equally troubling is the fact that Governor Padilla has hired Stephen Rhodes, the bankruptcy judge infamous for his pro-banker rulings in Detroit, to act as consultant in Puerto Rico’s debt restructuring process. In a recent interview, Rhodes explained that the situation in Puerto Rico “is a result of the same sort of phenomena we saw in Detroit.” Naturally, the solution for Puerto Rico will likely be quite similar to what has been seen in Detroit, including the stealing of pensions, the stripping of publicly owned assets, and the raising of prices for basic needs and utilities. Of course, because Puerto Rico cannot file for Chapter 9 bankruptcy protection, the situation might be even worse in the commonwealth. Speaking at the Summit Conference of the Organization of African Unity in 1986, the great African revolutionary leader Thomas Sankara famously said that “Those who lent money to us are the same people who colonized us, are the same who so long managed our states and our economies…We were not involved in the creation of this Debt, so we should not pay it.” His point, though specific to Africa, is in fact true for all colonized territories throughout the world. Latin America knows this fact well. And, despite its having been a possession of the United States for more than a century, this point is no less true in Puerto Rico. It surely was not the working and poor people who took on the debt, who made profits from bond sales, who gained from the massive increase in debt. In fact, if anything, their quality of life has gone down as a result of the period of massive debt accumulation. And yet, these are the people who will have to bear the burden of the austerity, who will have to pay to make investors whole. In effect, Puerto Rico has been thrust backwards in history, once again being made into a colony, this time not by the rifle and the sword, but by the debt. Its political process, like its economic development, remains captive to forces of the mainland United States. Once again, the island serves as an asset to be squeezed for every last drop by the forces of international capital. And once again, the people have no say in the matter. The lesson of Greece is here made immediately apparent: there is no democracy, there is no choice. There is only debt servitude. Of course, there are examples in Latin America that could be followed. The legacy of Hugo Chavez and the growing independence of countries in the region should serve as a signal to Puerto Rico that, rather than submission and continued servitude, it might once again be time to rekindle that age-old struggle, to demand independence, and to accept nothing less.